I was cleaning out my fridge last night and had some brussel sprouts I needed to use up, and I wanted to do something different with them so I decided to try them in a slaw. They are related to cabbage. 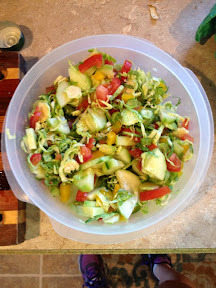 Once I started going through the fridge I found a lot of things that needed to be used, a cucumber, half a green pepper and half a yellow pepper, plus some roma tomatoes on my counter so I diced it all up. I think it made a very pretty addition to supper! oh, plus I made a vinagrette type dressing with olive oil and white wine vinegar and just a dash of agave syrup. I think I will make it again tonight with a different vinegar just for fun and play with adding some spices or herbs or something. It was so good. I kind of wanted to eat the whole thing by myself and not share it. Want a closer look? Sure you do, mmmmm. I also found this at Costco and used it on the baked sweet potato fries last night. YUM supposedly it contains all 84 trace elements we need to survive. My daughter likes it because it is pink. I picked this up at Costco too. I kept reading about people eating hemp hearts so I wanted in on it too. 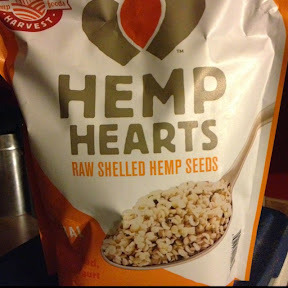 Not sure what I thought hemp hearts would taste like, but that wasn't it. They are kind of nutty. Pretty good on salads and yogurt. Plus they are supposed to be super good for you. Check it out. Three tablespoons of hemp hearts contain 174 calories, 12.5 grams of unsaturated (healthy) fat, 1 gram of saturated fat, 11 grams of protein and 1 gram of fiber. They are also rich in magnesium, iron, zinc, phosphorous and vitamin E.
Hemp hearts contain all the essential amino acids. Amino acids are the building blocks for protein. The essential amino acids are the ones our bodies cannot produce; we must get them through our diet. When a food contains all eight essential amino acids it is considered a "complete protein." Hemp hearts are a rich source of essential fatty acids, especially omega-3 fatty acids. The U.S. Department of Agriculture highly recommends regular consumption of omega-3 fatty acids. Like essential amino acids, essential fatty acids must be obtained through diet. I've never heard of hemp hearts. sounds...interesting?? Yay for 3 miles!! How do you feel? I have never heard of hemp hearts before. 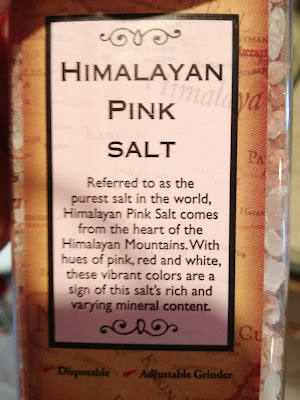 I have seen that pink salt before, but never really knew what it was. I might have to check it out. Your salad looked tasty! I love just throwing something together like that. That sounds awesome! I love brussels sprouts but never thought of using them that way. Thanks for sharing. That's a good idea with the brussel sprouts!! Yum your salad sounds delicious! Love the idea of adding agave to it! The sweet potato fries sounds yummy too! I have hemp hearts here. I tried them. They're fine. But I haven't really USED the rest of the bag. Yet. I think you must be in MY pantry. I figured hemp hearts would taste almost like oatmeal or something. **WOOOOOOO 3 MILES!!!!!! MOST EXCITING NEWS EVER! ** Love how you cleverly threw that in there like "oh... no big deal even though it's really a huge deal"
I love the Himalayan Pink Salt! I get it at Trader Joe's! 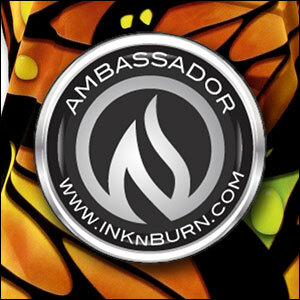 :-) I love that it has all the elements and a healthy dose of Iron! 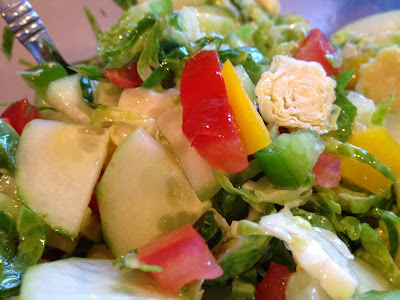 I have to admit that "salad" looks really good...I hate brussel sprouts, but maybe you hid them well enough.